The Bottom is a series of photographs that are an investigation of the historic neighborhood Old South Baton Rouge in Louisiana. This is the community that I live in and it has a complex history of segregation. I am making photographs of the landscape, residents and historical documents to look at how the past has shaped this area. Much of this area was originally the Magnolia Mound Plantation, and when it was sold it was divided into small shotgun lots, by design creating a low-income neighborhood. It was segregated in the 1950s, and during this time period it was a thriving self-sustaining community. It was in the process of desegregation and the building of the I-10 highway bisecting it into two that drove the area to collapse in the 1960s. The title The Bottom is a name given to the neighborhood due to half of it being settled below a fault line, an area that sits at “the bottom” and historically floods. I photograph city plans and maps juxtaposed with torn down houses and my neighbors to create a portrait of this community. I recognize that histories are often told from the person with the most power and I understand my privilege in making these photographs. I work closely with my neighbors photographing repeatedly and collaboratively to carefully negotiate my responsibility in how I am representing them. I hope the deteriorating infrastructure and highway can speak to the history of segregation while I strive for the portraits to show the happiness, anger, love and sadness of the residents. I carefully consider the use of color to portray a blur between past and present, with the neighborhood youth caught in the in-between. I want to create a record showing the complexities of both people and place. There is little visual history that exists for this area despite its historic importance during the civil rights era. I photograph to make a record that can hopefully draw a connection between past decisions and current consequences. In this work, I utilize news images and materially re-contextualize them to emphasize the limitations of photography as an emotionally and factually accurate record of the time. I combine analogue and digital processes to underscore the ways in which news photographs have been produced and how that production affects our understanding of cultural history. The photographs look at the selective representation of the individual within printed daily newspapers from the 1880s to the 1960s. The figures in the blocks are unknown, but they were at one point important, or significant enough, to have their image produced in this way. The images reveal how versions of history were presented publicly. I photograph to highlight how women and minorities were vastly under represented, and in re-presenting these images hope to reveal and question our flawed history. The images are etched into copper or zinc, creating long lasting portraits that have proven permanence over time. I imagine the names of the figures, question what they were once important for, and explore the social context behind them. I don’t seek to make a document as they were used before, but to photograph them as visual monuments. Men are abundant; women are few and far between. The images pertain to births, graduations, professions, weddings and obituaries. Through these images a story begins to evolve of the major life events and rights of passage that people continually move through then and now. The objects I photograph were originally made by a photomechanical process to reproduce photographs for publication and is an invention of Fox Talbot’s. It was the first time in history images of reality could be reproduced on presses reaching the public, rather than an image interpreted and altered by hand. While in use for over 80 years, it was an imperfect process that eventually was made redundant by offset printing in the 1960s. An outdated process, today these blocks have no use. They have become antiquated, much like the newspapers that they were once printed in. I am photographing them to present this historic process and lost imagery in a new way, using the technologies that made them obsolete. In re-photographing these images, my photographs are several iterations of light sensitive materials being exposed; the original photograph, the rephotographed negative, the photomechanical produced block, and my exposure. Each image thus goes from a positive, to a negative, recorded once again as a negative, then inverted to a positive. It is in this long chain of events, which traverses over decades, that the glow of light and color occurs. Together I strive for the photographs to describe the history of representation in American daily newspapers, as well as the history of photography. In the Printed Woman series, I use the original antique printing block and ink it onto a sheet of film in the darkroom. I then expose the sheet of film with a flash and process it. The resulting print is then scanned and made into an inkjet print. These photographs were made photographing the changing landscape of the Danby Marble Quarry in Dorset Mountain, Vermont. The Danby Quarry has been in use since the 18th century, it is over a mile long, has a footprint of twenty-five acres and is 1ó mile deep. It is the largest underground marble quarry in the world. I began photographing the marble curious about its use but eventually became charmed by the physical history carved into the space. The heavy unyielding material takes a geometric form inside a huge organic landscape. I am fascinated by the constant metamorphosis of the space. Etched, carved and broken apart Danby Mountain is a record of time. The physical markings inside the mountain created by the both the original method and the current method of quarrying is at the center of my interest due to its impact on the nature of the mountain. From the beginning of quarrying there to today the technology has vastly changed and is visible inside the walls of the quarry. In the shallowest depths the quarry reveals the chaos of past axe quarrying in the ceiling, showing every stroke each man took while the more recently excavated spaces reveal the control of diamond rope cutting into precise geometric cubes. Each method has left an indelible impression on the mountain by destroying its natural state and creating a geometric and ordered new landscape. These are the qualities that I find both interesting and intriguing. I am fascinated by it’s now formal beauty. My photographs of Dorset Mountain undulate between buried underground, immersed in darkness to being elevated into the sky and mountains, overcome by light. The sense of where you are is confused by ever changing planes of focus. The ground and ceiling, up and down, become indistinguishable. I photograph little to indicate scale, rather creating a world where a mountain can be a pebble, a crevice can be a valley and a stone can be a grave. Through photographic examination I hope to reveal the captivating landscape of this place while evoking a sense of its history and question how it will continue to change in the future. I began my work at Dorset Mountain but am in the process of moving both south and north along the Vermont marble trail that spans from Bennington to Montpelier and Swanton VT. I am also in the process of photographing where the excavated marble ended up and what it was ultimately used for. Largely, it has been used for gravestones and it is still currently being used for those of American Veterans. The photographs are made using a 4x5 camera on film, then scanned and printed as archival inkjet prints. This series of photographs about my family is titled All That Love Allows. 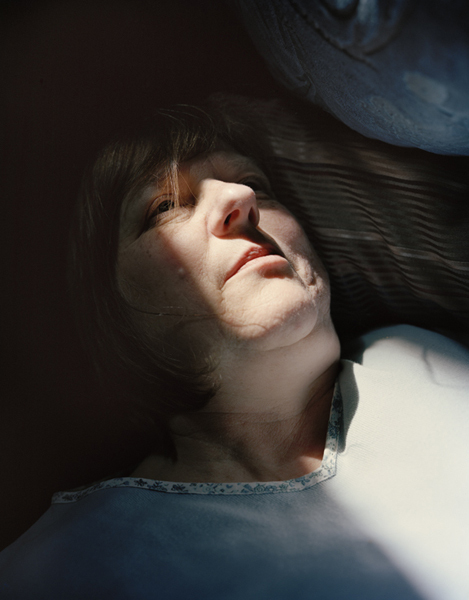 These photographs are a personal investigation of the changing relationships within my family. Photographing my Mom, Dad, and two brothers I am examining how aging and distance has changed our relationships, and how the lines of what I believe are normal have become blurred. It is a curious and strange time in our family as my mother is now aging and ailing and we, as her children, now care for her. My father holds onto the idea of my brothers and me as young children while my younger brother is neither child nor man. I still long for the days when we could all still fit and cuddle in the same bed on Saturday mornings. The expectations between children and parents have been curiously, and questionably reversed. These photographs are about the sadness and confusion of illness and aging, nostalgia for childhood, and an insecurity about the future. To make these photographs I stage my family within the family home in poses and situations that are from my memories, reflecting real and imagined occurrences. They are the staged family photograph, referencing both a theatre in photography as well as the familiarity of family snapshots.